Biosynthetic Technologies formulated and tested five different lotions to compare the performance of CocoEstolide as a moisturizer and barrier to water loss against three of the industry’s leading ingredients (plus a control lotion). These popular benchmark materials, which were blended at identical concentration levels, include a silicone (Dimethicone 250), a naturally derived ester (Isopropyl Palmitate), and a natural oil (Sunflower Oil). 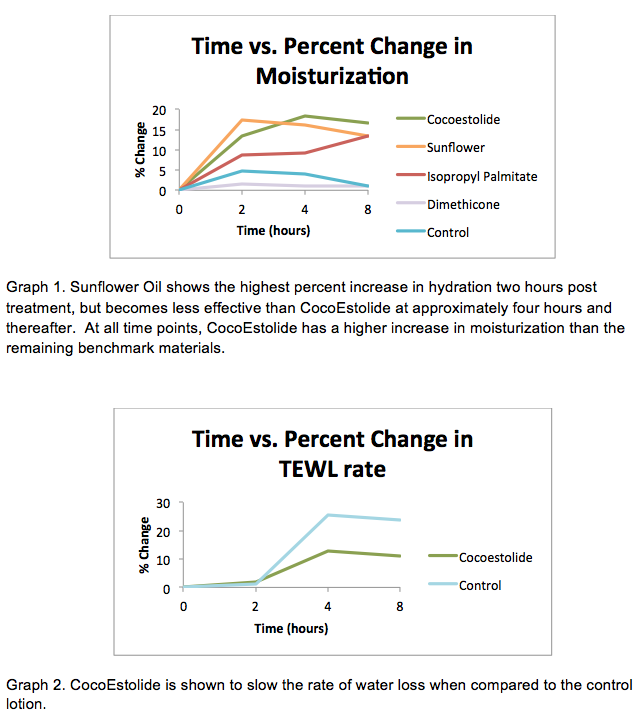 The percent change from baseline in moisturization and transepidermal water loss (TEWL) can be seen below in Graphs 1 and 2, respectively. With a refractive index of 1.45, CocoEstolide has the added benefit of increasing hair shine, enhancing gloss, and reducing whitening in antiperspirant residue. The high refractive index makes it suitable for use in lip products, hair care, antiperspirants, deodorants, and other clear products. CocoEstolide overcomes the challenge of the low oxidative stability often seen in natural oils. Most natural oils have an Oxidative Stability Index (OSI) range of 3-30 hours at 110°C, whereas CocoEstolide is reported to have an OSI of 38 hours. In a repeated insult patch test (RIPT), CocoEstolide was found to be non-irritating and non-sensitizing to the skin. This ester is also considered non-toxic and non-comedogenic. For a technical data sheet, please click here. For a safety data sheet, please click here.